Time to Recover from Breast Cancer Surgery | Surviving Breast Cancer Now! It was over 20 years since I had spent time recovering from surgery. Then a caesarian section had delivered a beautiful baby, this time less glamorously a cancerous tumour about the size of a baked bean had been removed from my body. I had difficulty, even yet, accepting my limitations and giving in to the time I would need to rest to give my body the time it would need to heal. Luckily, my husband set more realistic limitations than I was willing to admit were sensible. The care and attention he lavished on me with unquestioning love made me feel so cherished. During this period, before I went back to have my wound examined by Mr Osman, I needed to rest but also to avoid isolation and boredom. These can quickly result in a deepening depression that can be hard to shake during cancer treatment. Facing cancer alone must be not only frightening but lonely. 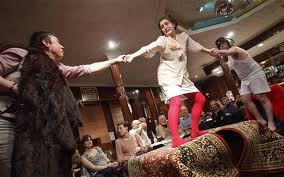 The play, “The Strange Undoing of Prudencia Hart”, came to the village. At wkwriters.wordpress.com we put together reviews. This is mine. The National Theatre of Scotland brought their performance of “The Strange Undoing of Prudencia Hart” to the Village Hall. It was exciting to have performers of this standard come to the village. Unsurprisingly, the show quickly sold out. The play was written by David Greig a Scottish playwright whose other works include Outlying Islands (2002) and The Architect which was made into a film in 2006. So it was no surprise that this works was thought provoking and entertaining. It began with an excellent renditions of “The Twa Corbies” and music played an important part in the performance which tells the story of the straight laced academic, Prudencia Hart. She is a serious child of bookish parents and enters the world of academe. The main story revolves around a conference in Kelso at which the staid Prudencia speaks to her thesis “The Topography of Hell” while her arch academic rival Colin Sinclair offers a much more modern approach to the Border Ballads. The first part of the play is performed in rhyme. After the conference Prudencia and Colin find themselves stuck in the border town due to a severe snowfall. Colin tries to get Prudencia to unwind, but fails. He joins in the karaoke at the pub with the locals while Prudencia sets off alone to find the B & B Colin has booked for them. She gets lost in a housing scheme and finds herself in a version of Hell that allows her time for self-discovery. The dialogue with a mysterious singer and the devil converts to prose and the second half of the play is much less tightly scripted than the first. The Hell into which Prudencia descends surrounds her with books which she, alone with the devil, inhabits. Millenia pass. In her bid to escape from Hell Prudencia persuades the devil that he needs to experience life as a human. Ironically it is her nemisis, Colin, dressed only in his boxers who facilitates her escape. A riotous musical finale ensues. Ballads and Karaoke numbers enhance the play. Music helps to change scene and attitude. Minimal stage settings allowed the small multi-talented cast to bring this provocative new play to our Village Hall. I also felt fit enough to attend the meeting of the poetry group the meets on the library. I was thrilled t be able to do that. It allowed me to thank the poetry group for the lovely bouquet of flowers they sent me. dregs of an unseasonable Sunday morning. At the library, I also picked up the next book promoted by the book group. It is run by successful, local author Evelyn Hood. It was Gardens of Water by Alan Drew. The story is set in a small town outside Istanbul, Sinan Basioglu, a devout Muslim, and his wife, Nilüfer, are preparing for their nine-year-old son’s coming-of-age ceremony. Their headstrong fifteen-year-old daughter, İrem, resents the attention her brother, Ismail, receives from their parents. For her, there was no such festive observance–only the wrapping of her head in a dark scarf and strict rules that keep her hidden away from boys and her friends. But even before the night of the celebration, İrem has started to change, to the dismay of her Kurdish father. What Sinan does not know is that much of her transformation is due to her secret relationship with their neighbor, Dylan, the seventeen-year-old American son of expatriate teachers. İrem sees Dylan as the gateway to a new life, one that will free her from the confines of conservative Islam. Yet the young man’s presence and Sinan’s growing awareness of their relationship affirms Sinan’s wish to move his family to the safety of his old village, a place where his children would be sheltered from the cosmopolitan temptations of Istanbul, and where, as the civil war in the south wanes, he hopes to raise his children in the Kurdish tradition. However, when a massive earthquake hits in the middle of the night, the Basioglu family is faced with greater challenges. Losing everything, they are forced to forage for themselves, living as refugees in their own country. Their survival becomes dependent on their American neighbours, to whom they are unnervingly indebted. As love develops between İrem and Dylan, Sinan makes a series of increasingly dangerous decisions that push him toward a betrayal that will change everyone’s lives forever. The deep bonds among father, son, and daughter; the tension between honoring tradition and embracing personal freedom; the conflict between cultures and faiths; the regrets of age and the passions of youth–these are the timeless themes Alan Drew weaves into a brilliant fiction debut. Sharing interests and focusing on things other than my illness were critical to recovery, both mental and physical. Trackback: More Reading, Listening and Sharing | Surviving Breast Cancer Now!